Widely recognized as the world’s leading dermatology manual, Habif’s Clinical Dermatology has been exhaustively updated to reflect today’s best practices. A wealth of new features makes it easier than any other resource to identify, treat, and manage the full range of skin diseases. Diagnose with confidence by viewing outstanding photographs for virtually every common skin disorder. Quickly locate the information you need with a Disorders Index on the inside front cover, a brand-new Regional Diagnosis Atlas in chapter 1, and a consistent, logical, easy-reference format in every chapter. This is a practical, useful guide to sound diagnoses of most of the more common dermatologic diseases with useful treatment protocols. It is a useful, practical guide, easily accessible to dermatologists and nondermatologists alike, to facilitate diagnosis and treatment of the more common skin diseases. A practical yet thorough guide like this is very useful in the field and the book attains its goal splendidly. Dr. Habif is a leader in the field of dermatology and is a master at imparting information in a clear and concise manner. He writes his book for students, nondermatologists, and dermatologists, and all will find it accessible, useful, easy to read and understand, and worthy of reading. Suggestions on how best to access and glean the most from the book start things off. A few minutes here and this detailed and thorough book becomes an easy and quick guide. Some basic chapters follow on nomenclature, necessary for communication in the field, and on topical steroids, which need to be understood in order to be safely and effectively used. The remainder of the book is divided into classes of disease. Unique features include an expanded online component with surgical procedures, references, and a dermatologic formulary. The latter will be updated and, thus, kept current. An index of disorders on the inside cover enables quick reference. The first page has a two-page index of commonly used medications and the last has a more detailed list of topical steroids. The book is thorough and detailed, yet easy to access quickly and will remain current with the companion web site. 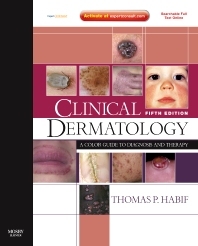 Dr Habif has refined his textbook, and this fifth edition is an easy to access, useful, practical guide that practicing dermatologists can turn to daily, nondermatologists can use to accurately diagnose and treat most of the more common dermatologic conditions, and students can use to learn dermatology in a useful and thorough manner. Because of the great attention paid to every aspect of this book, it is more practical and useful, while remaining thorough and detailed, than any other in dermatology.